Orange Bridge Park was dedicated Sunday, Oct. 9 by the Orange Township trustees and park board. The veiled sign was slowly revealed displaying the name of the 1.5-acre park that sits next to the foot bridge crossing U.S. 23. The name received the majority of the votes from residents in a contest held by township officials. The photo was taken the day of the dedication. During Orange Township’s five-hour (7 p.m. to midnight) meeting Monday, trustees were advised by Beth Hugh, Maintenance and Parks director, that the township had been awarded a $491,040 grant from the Ohio Public Works Commission. “This is for improvements to the intersection for a roundabout at Highfield and Green Meadows,” Hugh said. Trustee Debbie Taranto offered her congratulations and asked who had worked on the grant. “We work with the county on it,” Hugh said. Hugh said she couldn’t give a total estimated cost until the final drawings had been completed. Hugh said once the drawings were completed she could move forward with acquiring right-of-ways. She said the project would start in 2018 but construction wouldn’t happen until 2019. Trustees then moved to the parks report. Hugh said the three movies for residents to vote on for the June 23 movie event were Coco, Peter Rabbit and the Emoji Movie. She said residents could vote for their favorite movie on Survey Monkey April 9-16. The next item on Hugh’s list was a discussion for the Alum Creek Bridge Trail ribbon cutting. She said that the park board had initially suggested an early date in May but there was still some construction in progress. Hugh said once a date is confirmed, the cutting would be held at noon so the Army Corp of Engineers and Alum Creek employees who helped with the project could participate in the ceremony. Next on the agenda was a discussion for a naming contest for the new park on North Rd. 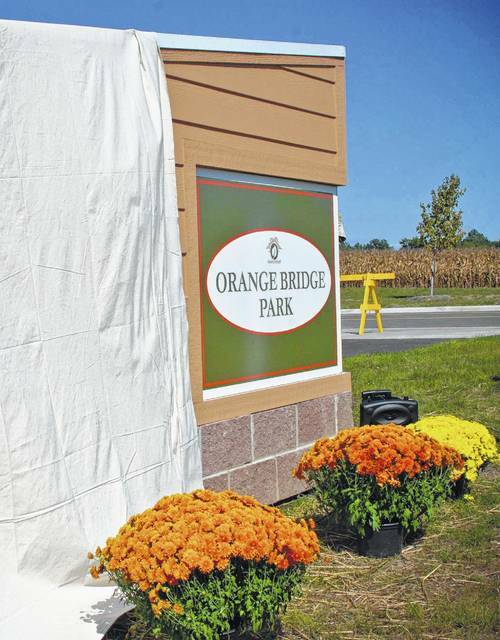 Orange Township celebrated its bicentennial October 2016 by unveiling the name for Orange Bridge Park, a 1.5-acre parcel next to the bridge crossing over U.S. 23 from the Orange Branch Library to the Mount Carmel Fitness Center. Rivers asked what the response was like for Bridge Park since he wasn’t a trustee during that time. “We had a pretty good response last time,” said Amanda Shetorem, Human Resources and Communication manager. Both Hugh and Shetorem said responses were even between both of the mediums. Knapp suggested that overall the park’s names came from the locations of the parks. “As park director, I would request we not call this one North Road Park because it’s very confusing with North Orange Park and North Farms,” Hugh said. Knapp insisted that it is where the park will be located. In 2016, the name of Orange Bridge Park had been suggested but trustees decided to hold a contest to let residents choose the name. The name still came back as Orange Bridge Park from residents. Hugh said she thought it was a great way to introduce the park to the residents. The issue was moved to the trustees’ agenda for April 16 at 7 p.m. at the township hall, 1680 Orange Road. This entry was tagged D. Anthony Botkin, Hugh, Knapp, Parks, Rivers, Shetorem, Taranto. Bookmark the permalink.